At Stepping Stone School, we are excited to unite technology and learning as we teach introductory skills in our early childhood classrooms by focusing on Coding Foundations. Coding foundations include higher order thinking skills associated with the coding process, including tasks like analyzing, predicting, planning, patterning, sequencing, sorting, organizing, and evaluating. Before introducing children to the technology tools used for coding, we practice the concepts of higher order thinking skills through screen-free, hands-on activities basic to the coding process. These activities enable children to work in small groups promoting teamwork, cooperation and sharing. With the support of a caring educator, children are encouraged to explore, overcome challenges and discuss their thinking, enabling them to learn skills which help them to become resilient problem-solvers. Preschoolers want to explore and understand the world around them. They’re curious about absolutely everything and they learn the most by playing, experimenting, and figuring out how things work. Developmental toys are some of the best ways you can provide your child with the foundation to grow into big thinkers. 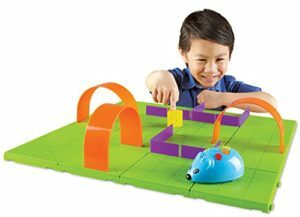 Code-a-pillar™ from Fisher-Price inspires little learners to be big thinkers by encouraging children to arrange (and rearrange) the easy-to-connect segments in endless combinations, sending Code-a-pillar™ on his path. This learning toy encourages experimentation while developing important skills like problem solving, planning & sequencing and critical thinking. There’s no end to the combinations children can make – mix up the segments and put them back together to send Code-a-pillar™ in a different direction every time. 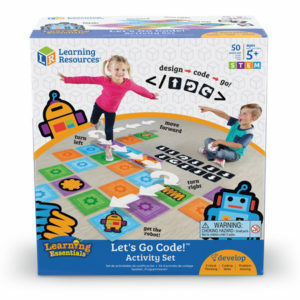 Code & Go™ Robot Mouse Activity Set by Learning Resources allows children to build a maze, and then use coding cards to create a step-by-step path for Colby the programmable robot mouse to find the cheese. 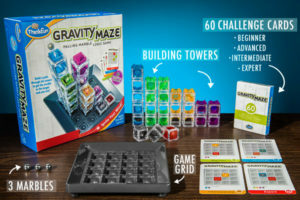 Gravity Maze by ThinkFun is a gravity-powered logic maze game that builds reasoning skills and visual perception. Children use the challenge cards to strategically place towers and create a path for the marble to reach the target. Let’s Go Code! Activity Set by Learning Resources allows children to build gross motor skills by stepping, hopping and turning. 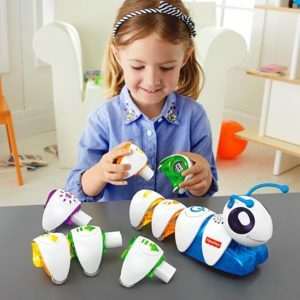 The set introduces children to early coding and programming ideas without electronics. 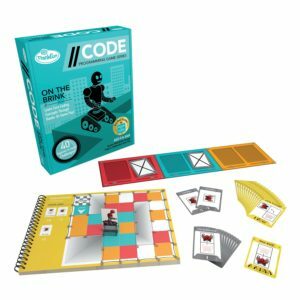 //CODE: OnThe Brink, by ThinkFun is a game designed to build the mental skills needed to fully grasp the concept of coding. The game is screen-free for a unique, unplugged play experience. Each of the 40 On the Brink challenges contains a map of colored squares. Each color has pre-programed moves for the Robot to perform. Using their problem-solving skills, children determine the moves that will successfully get their Robot from start to finish.